One of those rare times when I spent the Holy Week in my hometown instead of running around somewhere in another place, I went home on Holy Thursday due to having stayed till dawn in the office monitoring an activity. I initially wanted to go to Kalayaan town to take pictures of those people whipping themselves in public but instead I found them near the church, saving me the hassle of travelling to the next town. warning: Do not open if you can't stand the sight of blood! Talk about bloody mess with blood, sweat and dust; a "wholesome" sight for sado-masochistic delight! Note: the Catholic Church does not teach penance through flagellation, crucifixion or any form of corporal punishment to self to atone for one's sins. Wow, this is something new to me. 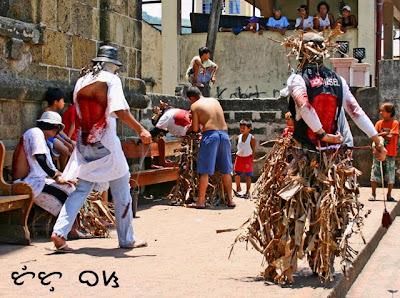 Watching these guys do this every Good Friday makes me wonder about the origins of the practice. Muslims flagellate too and this country was very Islamic until the Spanish conversion. One of my friends has lived in every country in Latin and S America. I'll ask if he saw any flagellation in those places. If so, perhaps it was a Spanish invention. uso pa pala yan hanggang ngayon.. I used to see some of my neighbors with wounded back because of that practice every Holy Week, but after a while....they all go back to their OLD VICES. gad! pagkatapos ba nyan dinadala sila sa ospital?? nakakaloka naman yan..
i've seen that before eh, some people talaga are doing that kind of penance pero ngayon ko lang na-realized na parang may mali... i don't know why..
Natatawa ako inspite of myself. grabe ang sakit nyan, pero sa tingin mo totoong nasusugatan sila? You didn't miss anything in Kalayaan. 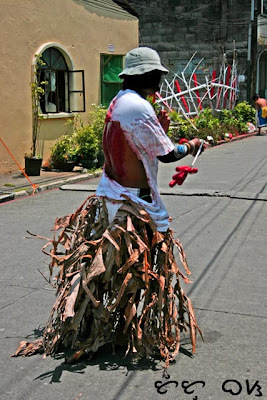 Most flagellants were wearing "modern" looking masks instead of the traditional ones. yuck, dis is so kadire! Wish I could bear hitting mi back with those improvised slammers they're using. Alam ko nilalaslas pa nila ung likod nila to have a much gorier effect + of course double the penitence. That is totally gory! I've never seen flagellants wearing shirts before. But their whipping is so hard, their shirts are all torn up. Oo nga... this is not taught by the church. Our religiosity could be very folkloric and animistic sometimes. 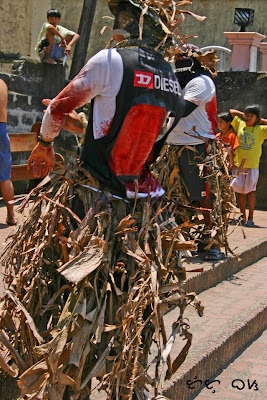 I see a lot of flagellants whenever I go down to the lowlands during Holy Week. It works for some people, but not me! I can't stand the sight of blood. Especially those that take it to the next level and "crucify" themselves. It's a mild passive form of extremism. Had witnessed these since as a kid in Subic, but to this day still cringe when I hear the sound and the see the blood. The ones in Subic wore no tops (shirts), though.